WHAT COMPELLS A FATHER TO KILL HIS DAUGHTER AT SCHOOL? GROUND ZERO PLUS 1235 DAY--New York, NY, Saturday, January 29, 2005--Nothing is more horrible to image than a parent brutally killing his or her own child. No act of Terrorism in the world is worse. No suicide bombing in Iraq, no crashing of planes into the World Trade Center--nothing--absolutely nothing competes with the senseless, horrific ugliness of a father stabbing his seven-year-old daughter to death in her Catholic School bathroom. 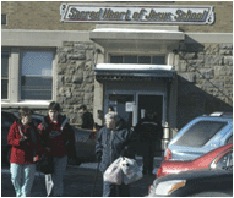 Jerica Rhodes body was found Thursday in the boy's bathroom of the Roman Catholic Sacred Heart of Jesus school in Highland Falls, New York. She was stabbed more than a dozen times. At the time of her death, her classmates were in the adjacent chapel saying morning prayers. Jerica's father, 27-year-old Christopher A. Rhodes, was charged with second-degree murder and is being held in Orange County Jail without bail. There was no motive known at the time of the arrest. Blood was found on Rhodes clothing and traces of what police believed to be Jerica's were found on the father's jacket. Linwood Rhodes Jr., Jerica's grandfather, had custody of the girl. She lived with her grandparents from the age of five months. Her father lived down the street and walked her to school. After allegedly killing his daughter, Christopher Rhodes drove to a hospital in Cornwall, N.Y. where he was treated for wounds on his hands. He returned to his parents' house in Highland Falls where he was picked up by police. Jerica's grandfather is a former police chief who runs the Rhodes Funeral Home in nearby New Windsor. He will handle his daughter's funeral, he said. Terrorism's roots are not in the battlefields of Iraq, Iran or North Korea. They exist beneath our very noses, in the way we raise our children and shape their belief systems. 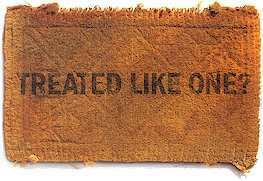 Children who are abused or neglected have greater odds of turning into some form of Terrorist from being wife beaters to becoming "doormats" and letting the world tromp on them. The most severe of these cases become killers of their own children. One can only struggle to imagine what twist of human character at what point in a child's life set into motion the formation of this child's Beast of Terror. What allowed it to germinate into an ugly cancer capable of taking a knife and driving it into the body of one's own daughter in a bathroom at a Catholic School? Those who want to "save the world" by eliminating Terrorism in foreign lands and providing freedom and liberty for the oppressed have much to do at home before going abroad. The ugliness of human nature unbridled is much more frightening than any cell of Osama bin Laden, for it is the enemy within rather than the one without that should startle and sober any society into action. The killing of Jerica is not an anomaly of violence by parents against their children in this nation. Sexual abuse and molestation of one's own child ranks but a notch below the physical killing of them, for emotionally the child is "killed" by the "touch" of a parent or guardian. His or her life becomes a pretzel, a twisted mass of shames and guilts that compel behaviors abhorrent to anyone who considers the innocence of a child the most precious of all human treasures. Child neglect runs a close second to physical abuse. The most elegant appearing of parents with scads of money and endless power and prestige may end up buying a child so many gifts to replace any "quality time" that the child soon begins to believe he or she is just another trophy on the shelf, a "thing" rather than a person. The killers of Columbine were the children of successful attorneys who provided their children "everything" yet nothing. They let the Beast of Terror breed in their child, ignoring all the signs that a child could be starving for love and care. In his or her own way, the neglectful parents stabs his or her children just as Jerica Rhodes' father did in the Sacred Heart of Jesus Roman Catholic school boy's bathroom at 8:10a.m. Thursday morning. Not all wounds bleed outwardly. The pain of a child is often stuffed under thick, chitenous calluses that grow upon the soul in heaps creating a defense against the pain and anguish of a world that cares little about the "person" inside the shell. America's divorce rate of fifty-percent is one of the great acts of Terrorism in our nation, for it rips apart the security of a child and divide's the child's love. It also signals to the child that marriage is an institution of pain and suffering, and that children are not important for if they were the parents would not find reasons to hate one another so much they couldn't live together. 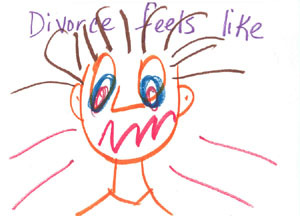 Divorce is a suicide bomb that explodes in a child's face, ignited by both parents at the child's expense. It is an act of great "Quiet Terror." Then there are the million or so abortions each year, where children in the formulative stages are killed for a wide range of reasons, but all basicly ending up at the same destination--"because I don't want a child." Stabbing Jerica when she is seven versus scooping her out of the womb when she was weeks old in gestation is simply a matter of timing. The killing of children by parents is still the killing of children by parents, no matter how desperately societies or individuals try to sanction the "right" to do it. In examining President Bush's inaugural speech and his call to action to fight Terrorism around the world, I found the speech hollow in reference to the great acts of Terrorism within our own land that result in the shaping of a parent who stabs his or her daughter a dozen or more times in her school toilet. Christopher Rhodes was shaped into a Beast of Terror by some force. That force lurks within us all. It is the "inherent" evil or bad or ugly part of our chemistry that may have its footprints in such deep genetic footprints that we cannot fathom such primordial chemistry could be part of such an "advanced" species. Today, in nature, there are countless examples of parents eating or killing their young for a wide range of reasons. 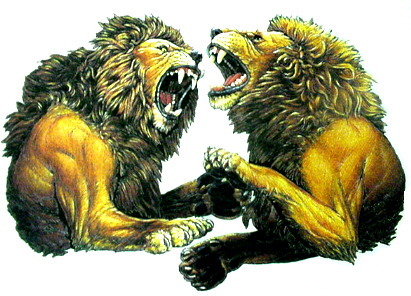 When a group of new male lions take over a pride they immediately kill all the cubs so that their line and not some previous lineage will prevail. Nature's consumption of its young is not headline news, but the idea that somewhere in the evolution of human nature there is a cold cell that numbs some of us to acts of heinous violence against our own kind shouldn't shock anyone. Killing is part of nature's way. What is not part of nature's way is allowing destructive genes to prosper. Those genes which threaten the security of the species must be altered or, by default, the species will die out. So it is with the message from Jerica Rhodes. Her death once more reminds us all that we must not become Complacent to the violence and pain we can and do create in those we love or should love the most--our children. From the wealthiest of us who abuse his or her children or are too busy to interact with the child emotionally and honestly, to the father who takes his daughter to school then repeatedly stabs her in the bathroom--much work is yet to be done in our parenting arena. That's why becoming a Parent of Vigilance is a proactive decision to improve one's parenting, grand parenting and overall human evolutionary skills. A Parent of Vigilance by the name alone suggests that the duty of Vigilance is to keep an eye on one's self as well as everyone else. It implies one must have his or her self in check and control before venturing out on the front lines to protect everyone else. I am convinced that if the Rhodes' family members were all practicing Parents of Vigilance, the odds their son would take a knife and stab their granddaughter to death would be slim and far between. While I cannot prove this to be true, I can say that the absence of Vigilance--Complacency--leaves the door open for the evolution of the Beast of Terror in any child. Equally so, the presence of the Pledge of Vigilance deters the Beast, for the Beast would rather take the "easy ones" than the "hard ones." So as you cringe and shudder thinking about Christopher Rhodes stabbing his daughter to death in the Sacred Heart of Jesus school bathroom, pause and look at yourself in the mirror. Ask yourself if your tongue might stab your children, or the back of your hand might, or the irritation in your voice at your children for bothering you while you are watching television, or the neglect you might give your child in the face of someone abusing them. Take action. Fight the Beast of Terror. Stunt his growth. Take the knife from his hand and the possibility that he can stab your children physically, emotionally and spiritually. 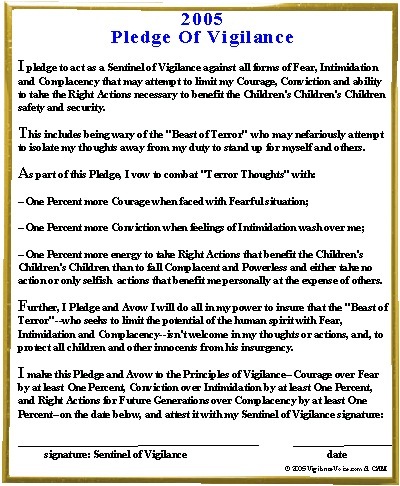 Take the Pledge of Vigilance. Do it for Jerica Rhodes. Go To Yesterday's Story: "When The President Forgets To Speak For The Children's Children's Children"